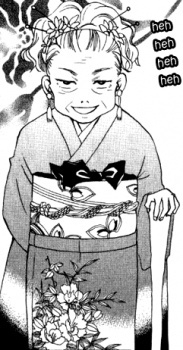 The matriarch of the Miura family, she is a small but crafty old woman who is stronger than she looks. She originally brought Satsuki to the Miura house and later helped her and Gorô elope. She has a bizarre fascination with different fashions, using her grandchildren and any other friends they bring as her "victims." Her particular fondness seems to be for historical fashion, mostly Japanese. Despite her benign nature, she also has a ruthless side, tied in to her desire for a stable heir to the Miura family. Her wish for that makes her go as far as to kidnap Ito and challenge her brothers into fighting to keep her.